In football, just like in any other sport, a highly competitive mindset can often make the difference between winning and losing. Cristiano Ronaldo knows it well and whatever he plays, he does it with a clear purpose: winning! Relentless drive! If you asked people to name who they think is the best footballer of all time thousands, if not millions, of people around the world would choose Cristiano Ronaldo. The Real Madrid forward has scaled the summit of the world’s most popular sport thanks to a ceaseless dedication to his craft. Honing his body with monk-like devotion and having the relentless drive needed to break the litany of records he has, Cristiano Ronaldo is someone everyone can gain a little inspiration from. Ronaldo's reluctance to take his eyes off the prize have led many to think of him as a lifeless automaton, a golem to be remotely commanded by Florentino Perez in his search for Champions League titles. Yet, delve a little deeper into Ronaldo's life and you see he has more interests than simply winning the Ballon d'Or – the prize given to the best footballer in the world. The Portuguese international has a penchant for poker, the pastime described by Doyle Brunson, the two-time World Series of Poker Main Event champion as, "A war. People pretend it's a game". It is understandable that a man with Ronaldo's competitive mindset would wish to relax by playing one of the most strategic games ever created, playing in both casinos and in the ever more prevalent online variants (on scams.info you can find out more about those). He, however, never loses his competitiveness even if the game is just played for fun. Everything he does, he takes seriously. 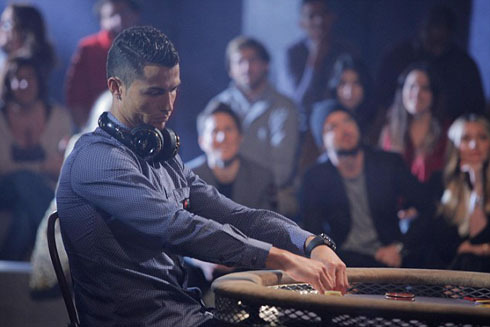 Ronaldo has extended his admiration for the game to the point he is now an ambassador for Pokerstars, a contender for the biggest host of online card rooms. In his capacity as ambassador, he featured in a head to head match-up with Aaron Paul, also known as Jesse Pinkman, Walter "Heisenberg" White's sidekick in the hit show Breaking Bad. 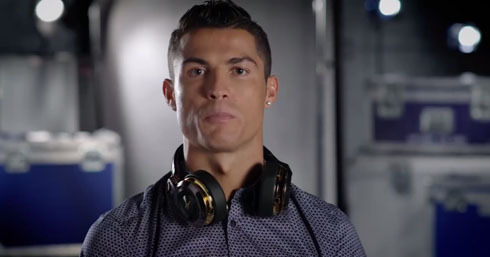 In the film, Ronaldo struts to the table in an immaculately cut shirt, hair gelled, huge headphones glistening around his neck. Having had his poker skills enhanced under the tutelage of Vanessa Selbst, the only woman to every be ranked number one in the world, he is confident. Across the canvas, Paul, having been coached by Fatima Moreira de Melo, is a worthy opponent. The game starts well for Ronaldo, with a face seemingly set in stone, he gives Paul little inclination as to what cards he holds. His steely demeanour lifting only occasionally in a succession of quick smirks that seem to unnerve his opponent. After a quick bit of back and forth, Ronaldo wins the first hand – football triumphing over theatre. The second hand however is a much shorter affair Paul blowing Ronaldo out of the water, going all in instantly. After a brief consultation with his coach, Ronaldo concedes the hand. Losing may hurt, but in doing so he learns something vital, Paul is a man willing to bet everything. The third and final hand sees an end to the contest. With a strong hand, Ronaldo gradually baits his adversary, forcing him to commit more and more of his chips, until eventually both men have put their entire supply on the line. Ronaldo, as he so often does, wins. Cristiano Ronaldo next game for Real Madrid is on May 6 of 2018 against Barcelona. You can watch Juventus live stream, Barcelona vs Real Madrid, Amiens vs PSG, Brighton vs Manchester United, Atletico Madrid vs Arsenal, and Red Bull Salzburg vs Marseille, all matches provided from our soccer live game pages.